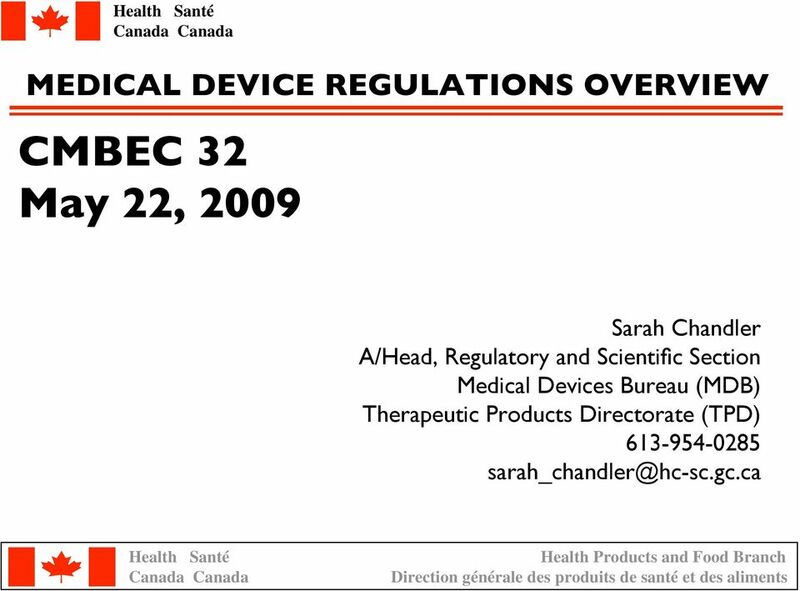 Download "CMBEC 32 May 22, 2009"
3 DEFINITION OF A DEVICE DEVICE means any article, instrument, apparatus of contrivance, including any component, part or accessory thereof, manufactured, sold or represented for use in: a) The diagnosis, treatment, mitigation, or prevention of a disease, disorder, or abnormal physical state, or its symptoms, in human beings or animals, b) Restoring, correcting or modifying a body function or the body structure of human beings or animals. 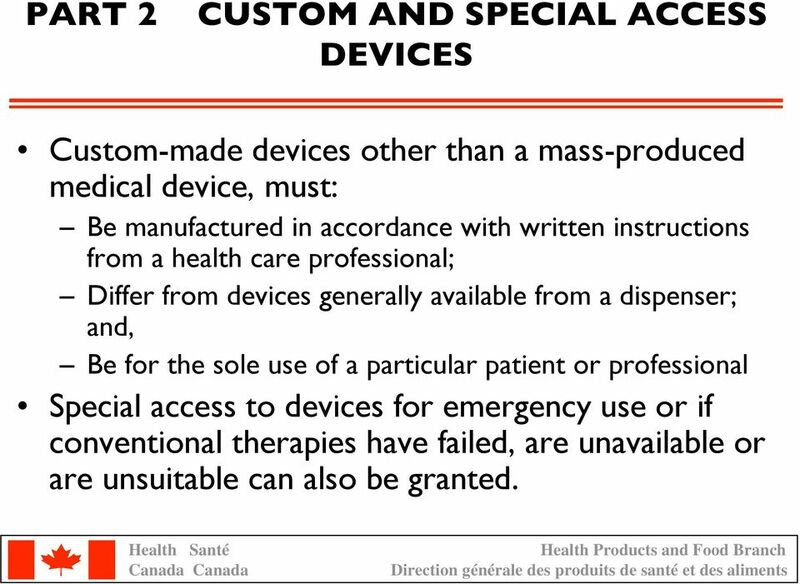 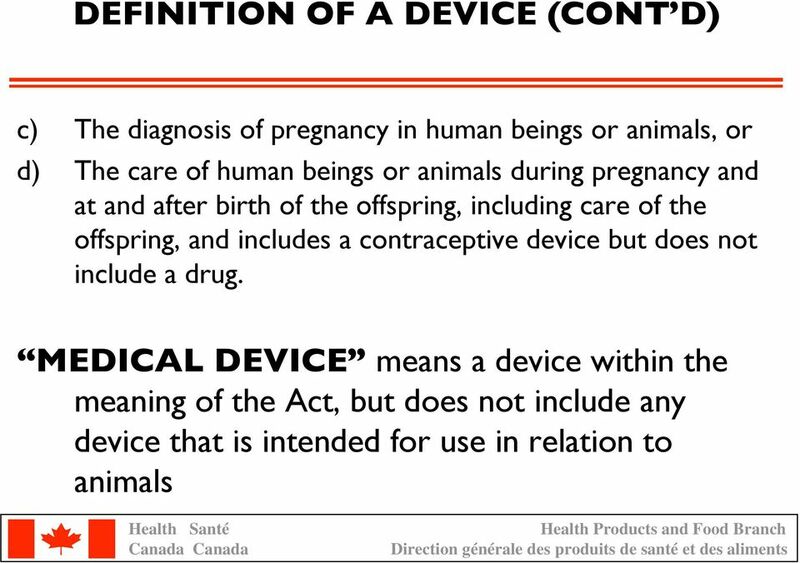 16 PART 2 CUSTOM AND SPECIAL ACCESS DEVICES Custom-made devices other than a mass-produced medical device, must: Be manufactured in accordance with written instructions from a health care professional; Differ from devices generally available from a dispenser; and, Be for the sole use of a particular patient or professional Special access to devices for emergency use or if conventional therapies have failed, are unavailable or are unsuitable can also be granted. 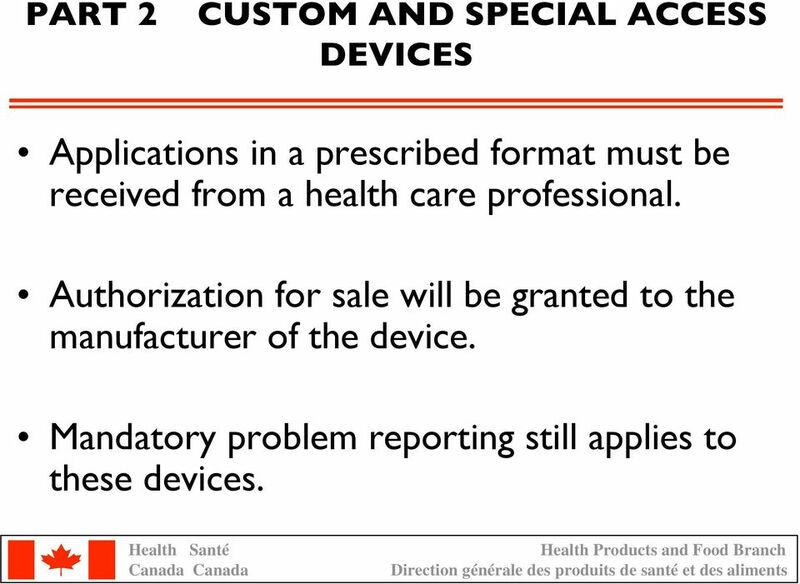 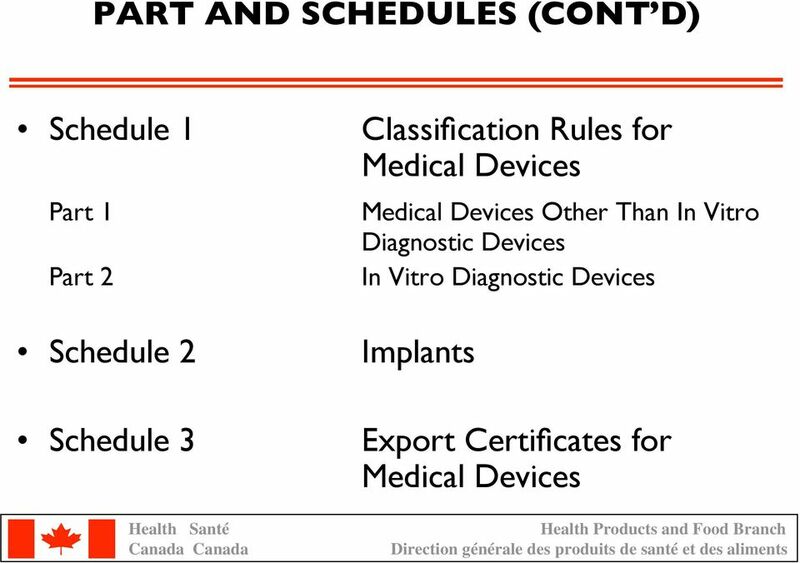 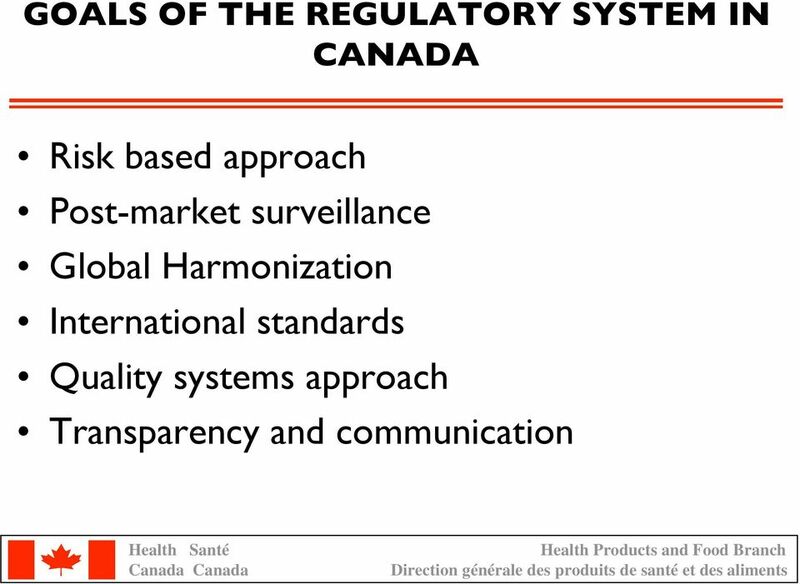 17 PART 2 CUSTOM AND SPECIAL ACCESS DEVICES Applications in a prescribed format must be received from a health care professional. 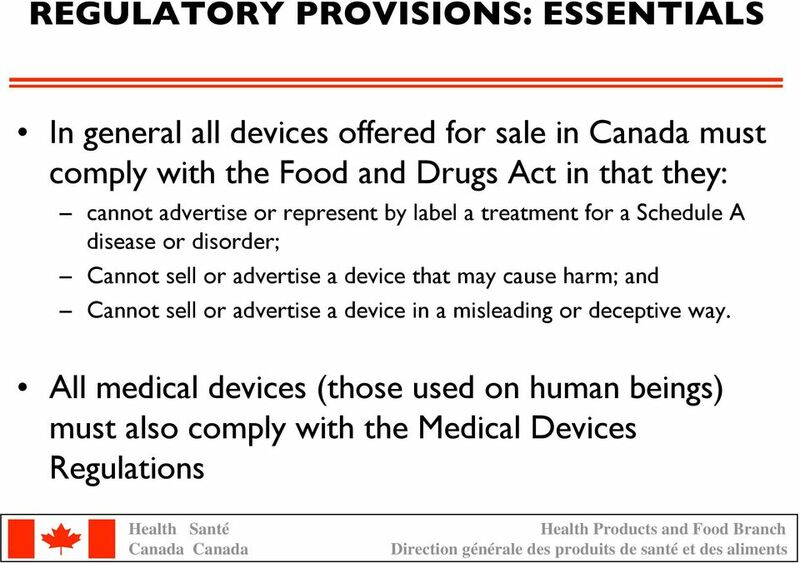 Authorization for sale will be granted to the manufacturer of the device. 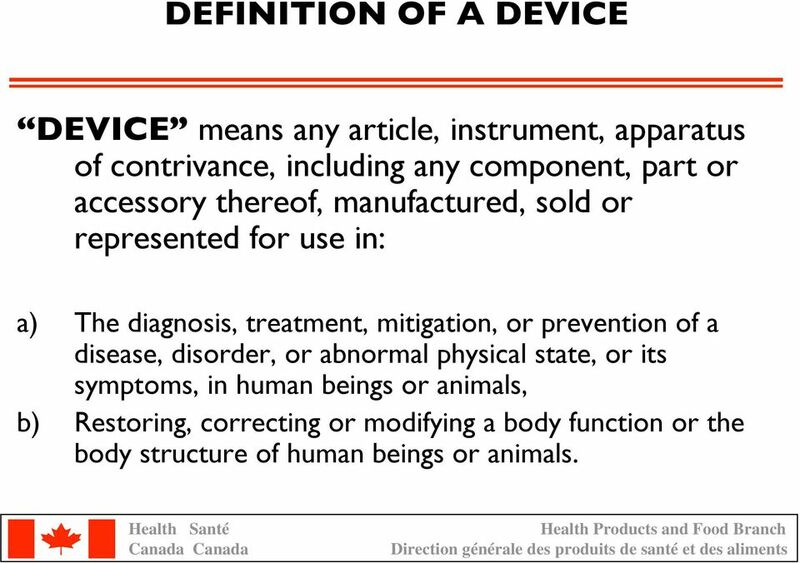 Mandatory problem reporting still applies to these devices. 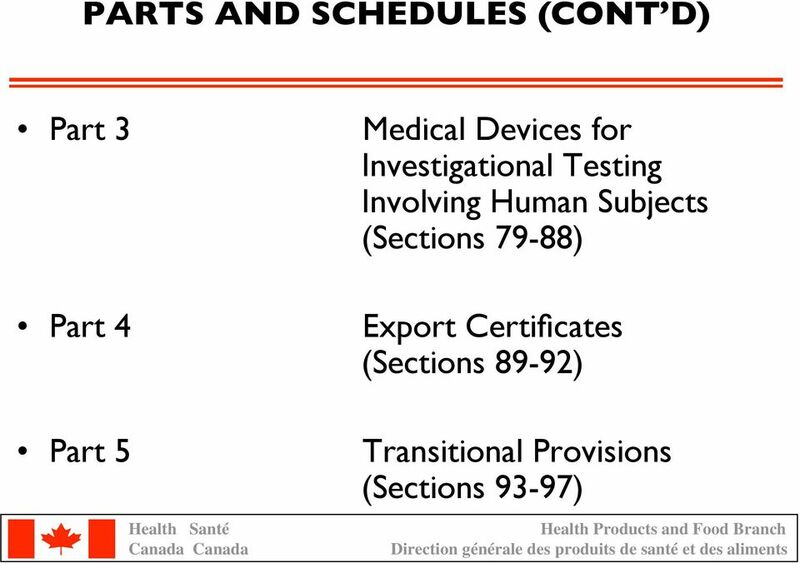 18 PART 3 INVESTIGATIONAL TESTING Grants the authorization to conduct clinical trials involving human subjects. 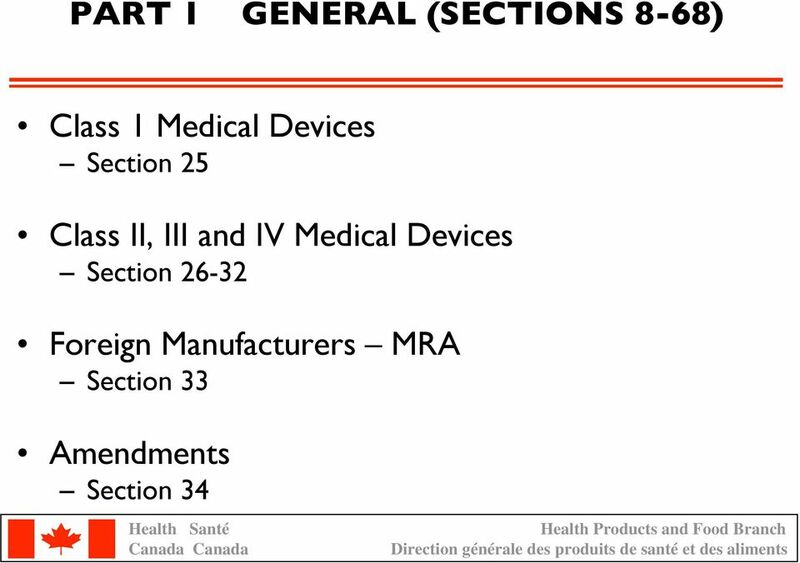 Allows manufacturers to acquire evidence of effectiveness as required by Section 12 (Part 1) of the Regulations. 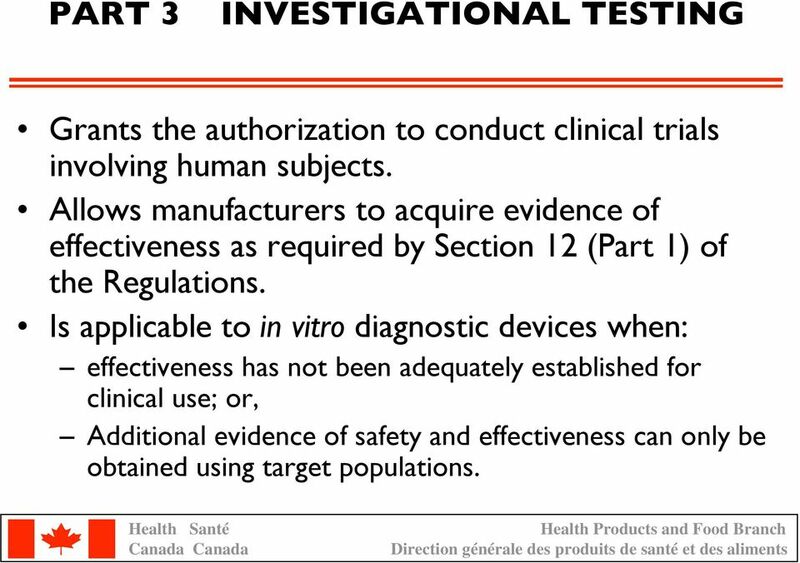 Is applicable to in vitro diagnostic devices when: effectiveness has not been adequately established for clinical use; or, Additional evidence of safety and effectiveness can only be obtained using target populations. 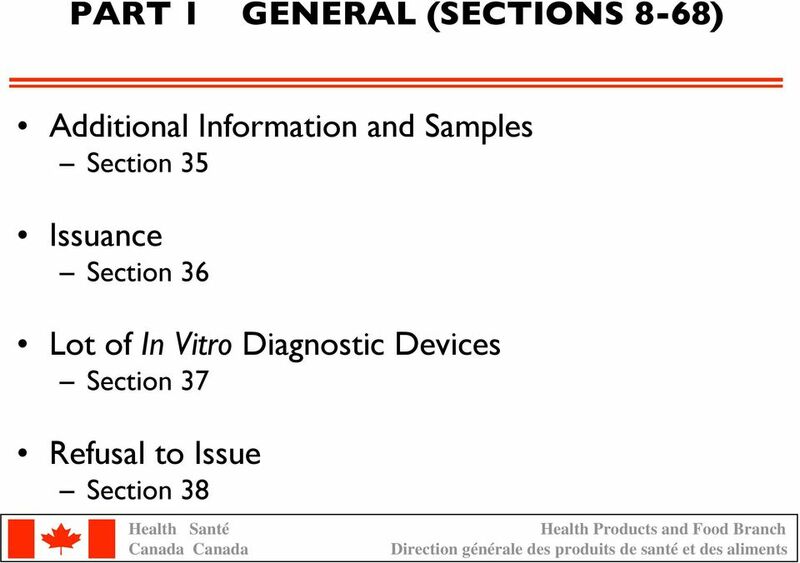 19 PART 3 INVESTIGATIONAL TESTING Applications are received from the manufacturer, including a risk assessment and detailed protocol. 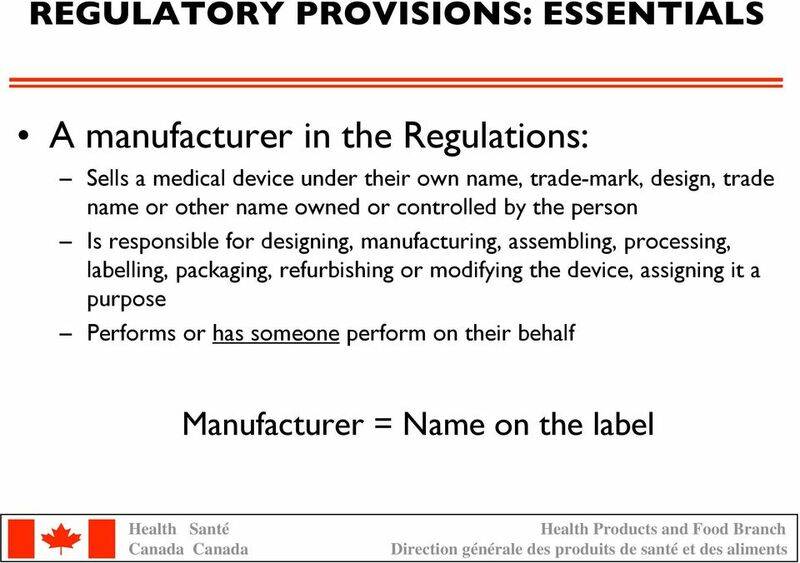 Authorization for sale is granted to the manufacturer. 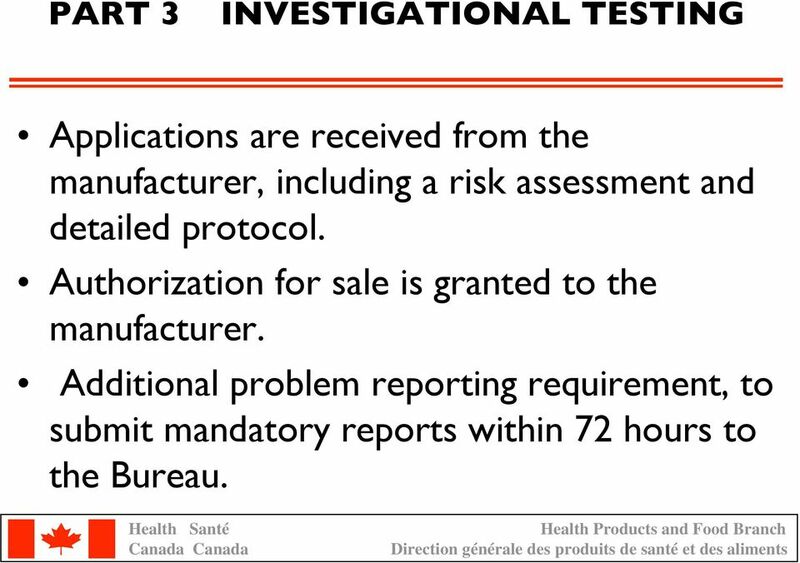 Additional problem reporting requirement, to submit mandatory reports within 72 hours to the Bureau. 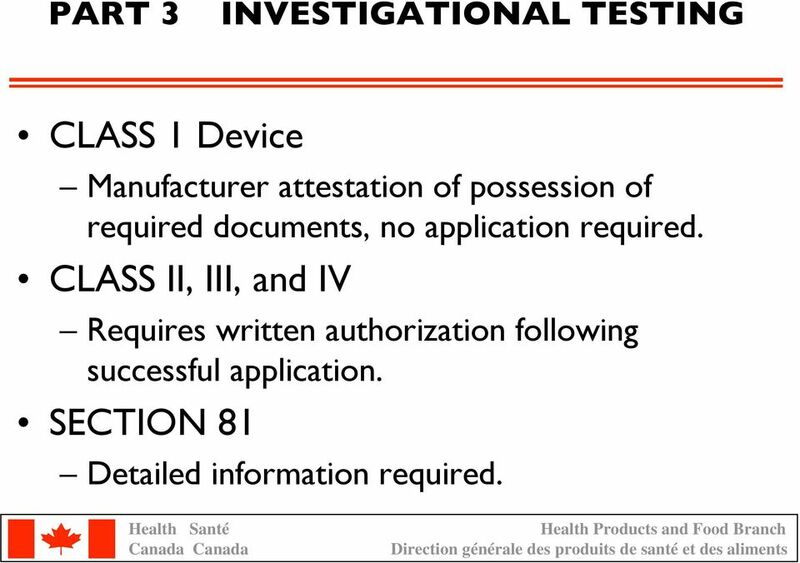 20 PART 3 INVESTIGATIONAL TESTING CLASS 1 Device Manufacturer attestation of possession of required documents, no application required. 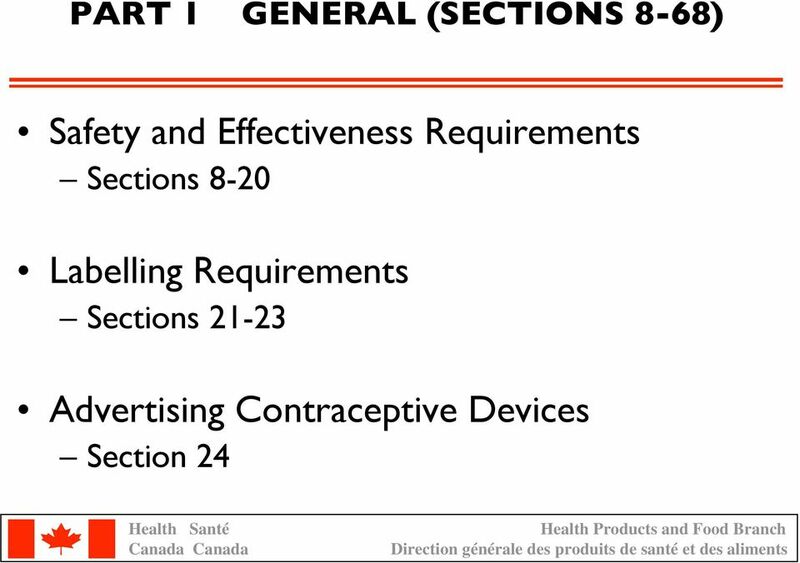 CLASS II, III, and IV Requires written authorization following successful application. 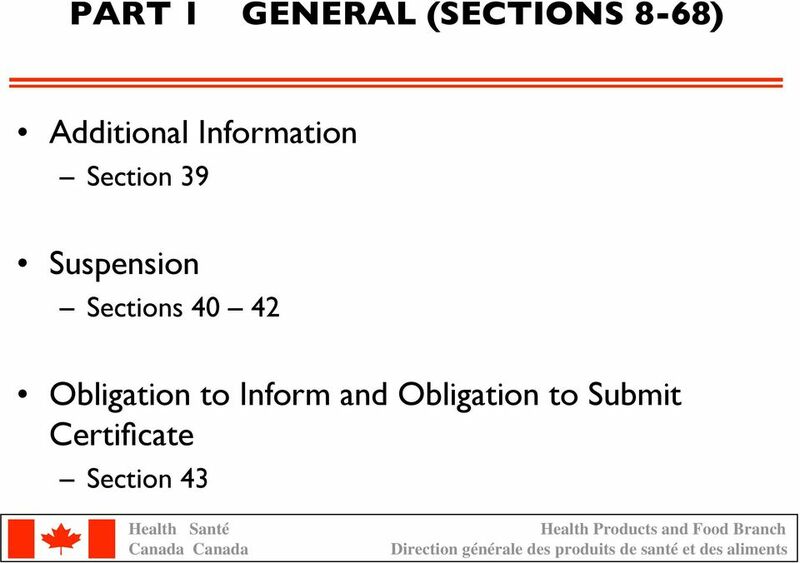 SECTION 81 Detailed information required. 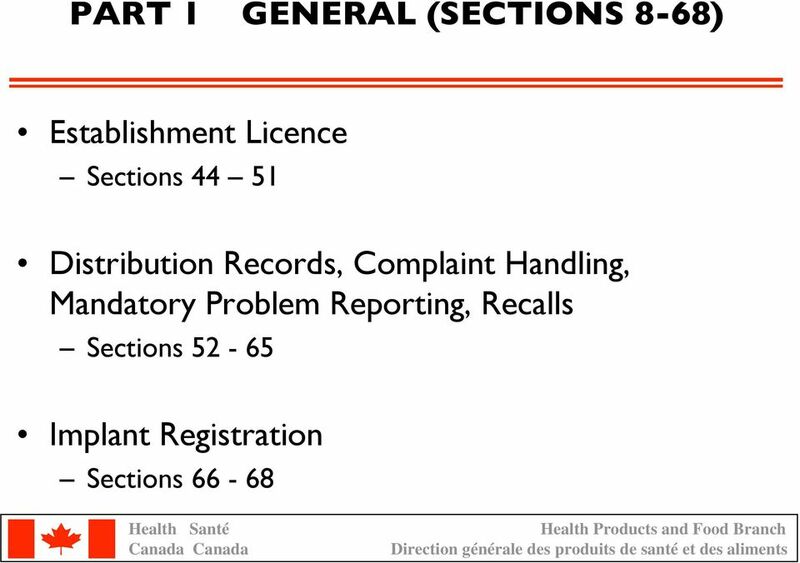 Règlement sur le personnel en matière de santé publique. 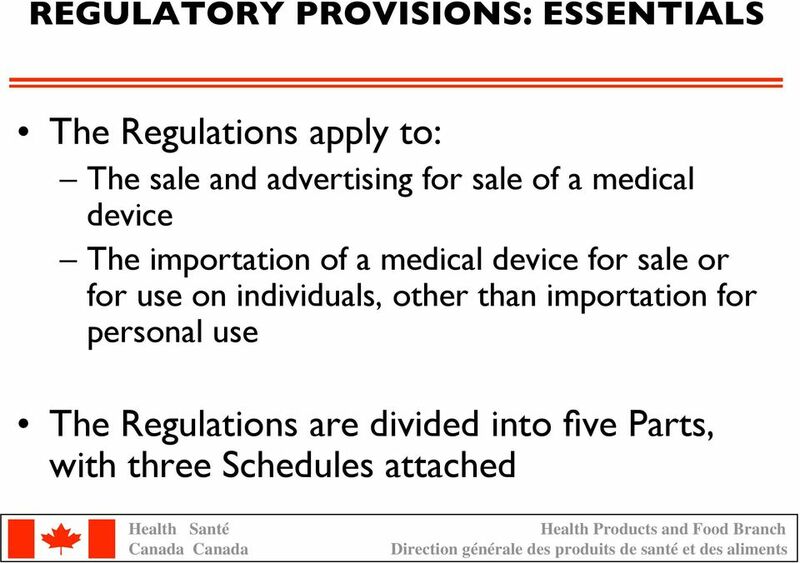 Public Health Personnel Regulation. 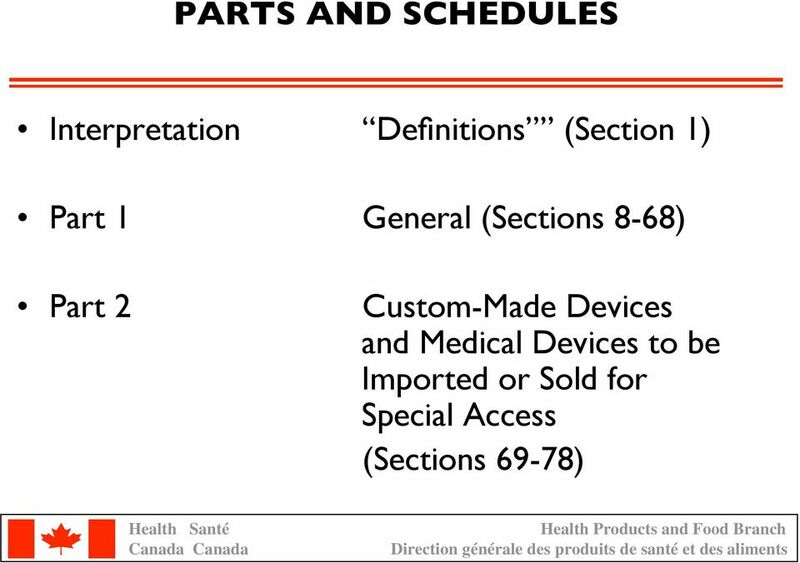 LOI SUR LA SANTÉ PUBLIQUE (c. P210 de la C.P.L.M.